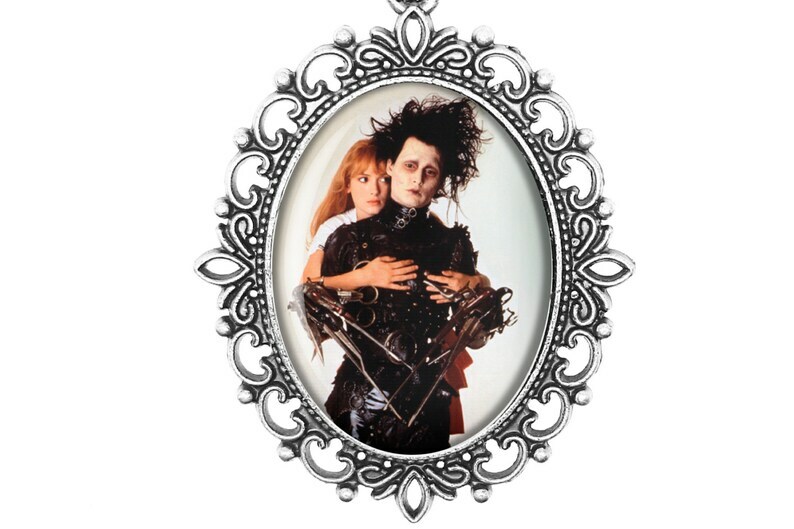 A glass sealed cameo depicting Johnny Depp and Winona Ryder as Edward and Kim from Tim Burton's enchanting Edward Scissorhands. As a huge Tim Burton fan, I couldn't not include his 1990 dark romantic fantasy Edward Scissorhands! (Easily one of my favourites and not just because it was released the same year I was born!) Johnny Depp at his best and a lot of crazy hair cuts... what more could you ask for?! All of my cameo necklaces are available in either an ANTIQUE BRONZE OR ANTIQUE SILVER finish, LARGE OR SMALL size and come with a choice of CHAIN LENGTH; 18" OR 32"